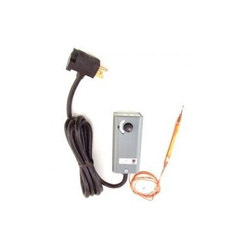 From Johnson Controls, a trusted name in temperature control and thermostats, comes this handy external thermostat that can be used to keep your beer at just the right temperature! The unit consists of a probe that goes into your cooling device (refrigerator or freezer), an analog thermostat that ranges between 20 and 80 degrees Fahrenheit, and a power cord with plug outlet for the cooling device. Simply place the probe on the inside of your cooling device, plug your device into the unit, and set your temperature. Done! The unit will interrupt power to the cooling device when the temperature goes too far out of range of the set temperature. Note: that there is a 3 ½ degree differential between the set point and the actual temperature. However, this range should have minimal effect on the actual beer temperature. Using this control, homebrewers have been able to make excellent lagers all year round, cold crash their beers, and so much more! Bought this to control the temp of a chest freezer for my kegerator. Been running like a champ since I got it. Beer is being served at just the right temp. Simple to use, works great, and a good price. I purchased the Thermostat to control a large two door commercial freezer and it seems to be working like a charm. I am fermenting salami in my freezer and the controller works great! The staff was very helpful and friendly.